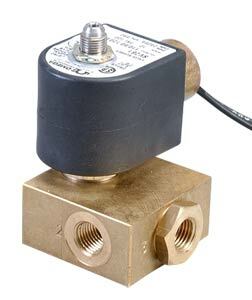 Find how a Solenoid valve works on this link. The SV241, SV242, and SV261 Series valves are 3-way, directacting, and normally closed. The SV241 and SV242 can be used for liquids or gases, while the SV261 offers a quick-exhaust feature and is limited to air use. The most common application for these 3-way valves is the control of single-acting cylinders or spring-return actuators. The pressure inlet port is blocked in the de-energized position.